At this point I think it’s safe to call The Golf Club an actual sports franchise. Ever since cementing 2K as publisher earlier this year, the hits have just kept on coming. The crowning achievement was securing the rights to the PGA Tour back in February. This is a gigantic get for HB Games, especially when considering that the PGA license has been locked up by Electronic Arts in one form or another since 1990. As exciting it may be, the lingering question still remains: has The Golf Club 2019 actually earned its tour card? 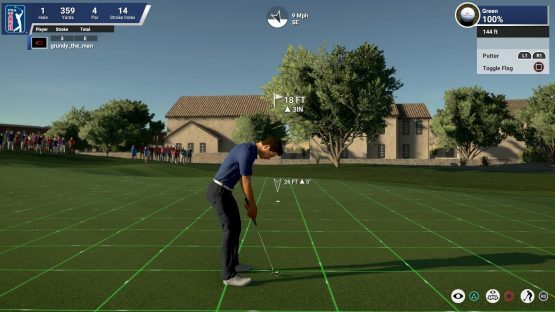 While this is an officially endorsed PGA Tour product, a cursory glance at the title denotes that this is far from a spiritual successor to the PGA Tour series popularized during the Tiger Woods era. 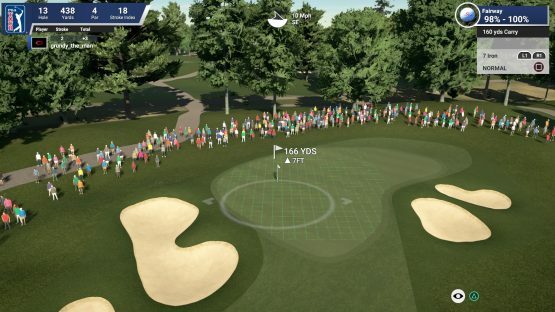 The Golf Club 2019 Featuring PGA Tour implies two specifically unique components: The Golf Club core experience and the additional PGA Tour themed pieces. It is hard to say why this segregation is necessary, but the delineation between the two brands is immediately apparent. The extent of the licensing agreement consists of a handful of courses from the actual tour, including the like of TPC Sawgrass and TPC Scottsdale. Amusingly enough, when I was playing through a round with one of my visiting siblings, we were actually able to pinpoint that a specific course we were playing was TPC Scottsdale, thanks to the familiar course design. That said, the limited palette of art assets still resulted in the six premium destinations suffering from the same under-achieving presentation issues as any other user-created course. The fact that specialty locations didn’t feel superior in any respect was a huge missed opportunity that does a disservice to the PGA brand. Another extension of the professional cross-pollination impacts the career mode. Starting out in Q-School and proceeding through the Web.com Tour, the single player campaign caps off with a full run-through of the FedEx Cup’s 32 event season. Given the substantial length of the campaign, this means that a vast majority of the courses will still be originals, designed by the team over at HB Games. While I would’ve loved to see more PGA locations make the cut, there are still plenty of opportunities to build out the roster through future DLC. Here’s hoping that expansions are on their post-release roadmap, because there needs to be more representation from the regular season Majors. I’m looking at you, Augusta National! Even though you’ll be driving from the same tees as the professional players, don’t expect them to joining you from the gallery. It doesn’t appear that player likenesses were ever part of the licensing agreement. Like we led off stating, this is a far cry from previous PGA Tour titles, but it’s a perfectly acceptable starting point. Remember, the PGA Tour is only a featured component of the entire package, which leaves plenty of room for growth in future installments. If you’re already acquainted with the previous The Golf Club outings, the rest of the game should feel extremely familiar. Components such as the stellar course designer are making a triumphant return, bringing with it a gigantic bank of over 170,000 user-generated courses. Even if you don’t have aspirations of creating the next Golden Bear, everyone reaps the fruits of the community’s painstaking labor. The sheer volume of legacy DLC content mind-boggling to think about and introduces what amounts to an infinite well of ever-green content. The Society mode from last season also returns, making full use of this dense bank of original content. Competing in seasons against the general public is a great way to both hone your skills and soak in some of the more unique course layouts designed by the community. Especially when you are trying to perfect the finer aspects of the swing mechanics, having a low-risk arena to explore is an invaluable tool. Easily the strongest aspect of The Golf Club, year-in and year-out, has been the motion-focused swing mechanics. For newcomers, the controls will take quite a bit of trail-and-error to fully understand. Using a backwards slide of the stick to initiate backswing and then directing the follow-through by thrusting the same stick forward is far more nuanced than it seems at first glance. It’s extremely important to pay close attention to both the direction of the forward swing as well as the tempo of the two stages of a drive. Consistency is the key to a quality shot. The speed of a backswing should mirror the speed of the forward swing. Initiating the drive at the proper point in the backswing also plays a crucial role in determining the distance of a shot. Holding onto the backswing for too long causes a hesitation at the precipice, which murders the forward momentum of a stroke. This also happens when prematurely interrupting the backswing, but it’s intentionally used to shorten the distance of a shot. Assuring that the stick’s movement remains straight is also important. With experience, more advanced players can learn how to use a purposely curved stick movement to either direct shots around objects or apply additional English to the ball upon landing. While stellar controls immediately set this title apart from the rest of the field, there are still aspects of the gameplay that lag behind what you’d expect from a game carrying the PGA Tour name. For one, there are constant instances of texture pop-in, especially when using the camera to zoom in and out while aiming shots. As impressive as holes can look in motion, these sorts of graphical hiccups shouldn’t be happening this far into a console generation. Animation quirks and cookie-cutter gallery members also eat away at the credibility. If an errant shot is hit into the crowd, spectators should be running for their damn lives, not standing there like an Easter-themed mannequin that’s missing a couple of chromosomes. A last blemish is the groan-worthy commentary. One member of the booth team is only allowed to chime in at the start, midway point, and end of each round. Further exacerbating matters, when his mic is hot, he adds very little to the overall conversation. If the poor guy’s muzzle is only loosened every fifteen minutes, he should at least offer a piece of insightful analysis. Instead, it feels like these pieces of throwaway dialog could be completely removed without impacting the experience in the slightest. Moral of the story: If you have a two-man booth, mayhaps both should be allowed to speak? Imposing a gag order on one of them ends up sounding stupid and underdeveloped. Without question, The Golf Club 2019 has received a large credibility injection thanks to the involvement of the PGA Tour. Sadly, this feels like a half-implemented crossover that doesn’t utilize the license to anywhere near its full potential. Hitting the course is as gratifying as it’s ever been, but the end product feels like it needed another trip to the driving range before its tee time. Like a 320-yard drive on a par 5, it’s a fantastic starting point, but still well short of the flag. The Golf Club 2019 Featuring PGA Tour review code provided by publisher. Version 1.0 reviewed on a standard PlayStation 4. For more information on scoring please see our Review Policy here. Where are they hiding the second announcer?